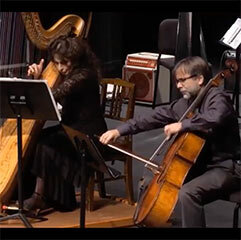 Click here to view a performance of American composer Michael Kurek's Serenade for Violoncello and Harp in Philadelphia, Nov., 2017. Ovidiu Marinescu, cello, and Rita Costanzi, harp. Oregon Ballet Theatre's production of James Kudelka's Hush! 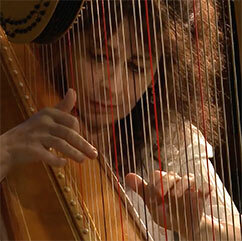 The harp is one of those instruments that has universal appeal. 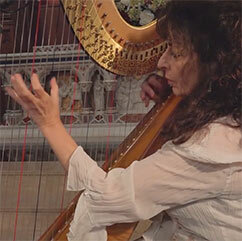 Combine that fact with the musical artistry of RITA COSTANZI, and the results are truly heavenly. Costanzi's star shines very brightly indeed in this first solo disc for CBC Records. She presents a constellation of cultures and traditions, with appropriate favouritism to French repertoire, the harp most closely identified with the French. 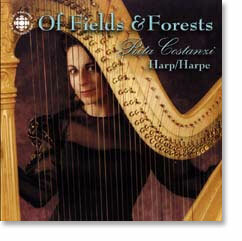 The disc takes its title from Canadian composer, Jean Coulthard's, Of Fields and Forests. "... a seductive harp sampler." 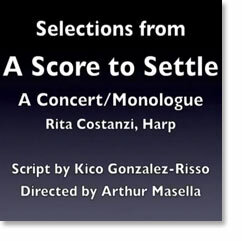 For information on how to order this CD, please contact Rita Costanzi. Rita Costanzi, harpist with the CBC Vancouver Orchestra, has assembled a program of music that interprets the entire Nativity Story – which is not unusual for Christmas songs. What makes this CD unusual is that Costanzi has found enough pieces to do it in purely instrumental terms. This local label seems to be carving out a Christmas niche. 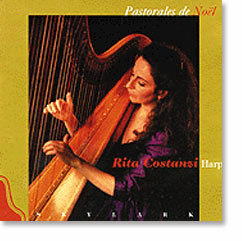 The best is by superb harpist Rita Costanzi. Here she weaves a hypnotic spell with her deft combination of expected classics and rarer items. 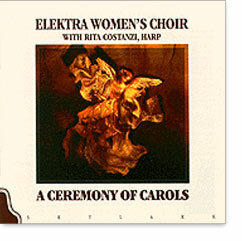 Elektra sings three Christmas works with harpist Rita Costanzi. Ceremony of Carols by Benjamin Britten—surely the most famous piece ever written for choir and harp—is a series of musical gems that is exuberant, innocent, and moving. Concierto di Navidad by Paul Csonka features Spanish sensuousness and catchy Cuban rhythms. In Dancing Day, John Rutter retells the central event of Christmas simply and vividly in a tapestry of dance tunes. Song of the Stars, an album of Celtic Solo Harp music for contemplation and healing has received international acclaim and a five-star rating from CBC Radio’s Sound Advice. 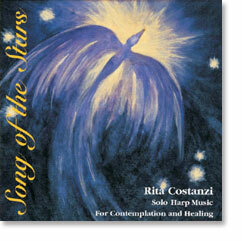 Rita Costanzi's latest CD Song of the Stars was recorded in response to the increasing demand for assistance in the care of pre-palliative and palliative patients. Rita lends her immense talent and artistry to a cause that is close to her heart. This CD is not only in memory of a friend, but for all who are troubled, ill, in fear, pain or dying - and to all who accompany them. For information on how to order this CD, please click here.